This is the moment scientists took cell samples from a 40,000-year-old extinct baby horse in a bid to clone the species back to life. The Russian-South Korean team claim the experiment on the male foal is the ‘first step’ in restoring the long-gone woolly mammoth, their ultimate goal. 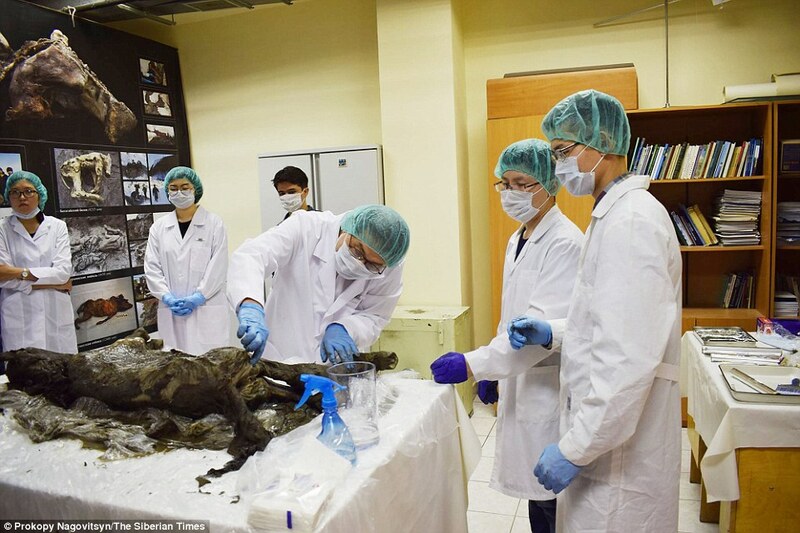 Laboratory pictures from Yakutsk – the world’s coldest city – show the search for ‘living cells’ on the light ginger-coloured carcass frozen in permafrost for between 30,000 and 40,000 years. The foal was discovered in the frozen subsoil of a Siberian crater known as the ‘Mouth of Hell’ and was around 20 days old when it died. Close-up images highlight the extraordinary life-like preservation in the planet’s natural freezer. Tens of thousands of years of dirt was washed off the young foal, revealing a black mane and tail with a dark stripe along the spine. ‘Fortunately, the animal’s muscle tissues were undamaged and well preserved, so we managed to get samples from this unique find for biotechnology research’, said Dr Semyon Grigoriev, leading researcher at Russia’s mammoth Museum. Cloning specialist Professor Hwang Woo Suk flew in from Seoul to spearhead the search for living DNA material from the foal. ‘If we manage to find a cell, then we will do our best to clone the unique animal,’ he said. A mare of a horse species similar to the extinct Lenskaya breed will be used as a surrogate, he told The Siberian Times.